There is audio, above, that goes with this article, for easier understanding. Architects, Paul Murdoch and Byrd Woltz designed the memorial with the shape of a crescent. Would they design a memorial for an attack in a predominately Muslim nation in the shape of a cross? The architects now call it a broken circle. The only thing different is that the arc of the circle, the part that is broken off of the circle, is now placed behind the opening of the crescent. The unbroken part of the circle, what symbolically remains standing in the wake of 9/11, is still a giant Islamic shaped crescent. This would be recognizing a peace circle being broken, hence depicting the actions of (and honoring) those who broke it: the terrorists. We want those who broke the chain of events to be honored, the forty passengers and crew on Flight 93, not those who broke the circle of peace. The original design is shaped as a crescent, with the crash site placed roughly in the position of the star on an Islamic crescent and star flag. If you were to stand right between the tips of the crescent and face into the center of the crescent, you would be facing North East, which from the crash-site is the direction to Mecca. That is the Muslim direction for prayer, so if you are a Muslim, this site should make you quite happy. Mosque, but also to pray at a terrorist-memorial mosque. "Mecca" (Makkah in Arabic), the center of the Islamic world and the birthplace of both the Prophet Muhammad and the religion he founded is the direction that Muslims pray five times a day. Muslims face towards Mecca and are united to the Ka’ba (Islam's most sacred shrine in Mecca) by an un-seen line of direction called the qibla. You may have heard about the fifth pillar of Islam, the pilgrimage to Mecca. The fifth pillar of Islam says every able-bodied Islam with money enough to go, is to go to Mecca once in his or her life. After an up-rise over the original design, architects, Paul Murdoch and Byrd Woltz presented another. However, the new design still fully includes the first design. All the architects did was place an arc of trees behind the opening of the crescent on the original design. The arc of trees is not connected to the original crescent. It does not connect the ends or in any way close the opening of the already existing arc of trees that form a crescent. According to the Park Service’s own website, the circle is still broken. The unbroken part of the circle, what remains from the terror attack on Flight 93, is still a giant Islamic crescent, still pointing to Mecca. The architects now describe this as an arc of trees embracing a field of honor, instead of using the word crescent. Geometrically a crescent is an arc. An architect would be aware of this. Replacing a word with a synonym of that word, and placing an extra arc that is not attached to the original arc/crescent, is not a true redesign. To sum it up, the new design that is now called the Circle of Embrace is not a circle at all. But rather it is an arc, a crescent with an arc of trees behind the opening. An architect knows a broken circle is in fact, an arc. In this case, a crescent. The forty-four translucent blocks are all placed along the flight path that symbolically breaks the circle. Forty are inscribed with the names of the heroic passengers and crew. Three more of the same size translucent blocks are inscribed with the 9/11 date. They are set in a separate upper section of Memorial Wall that is centered on the centerline of the giant crescent, which is the exact position of the star on an Islamic flag. The 9/11 date goes to the Islamic star. The date goes to the terrorists. The forty-fourth translucent block on the flight path is larger than the others. It is the giant glass block that sits at the upper crescent tip, commemorating the spot where the terrorists broke our peaceful circle and turned it into a giant Mecca-oriented crescent. To be inscribed: "A Field of Honor Forever." Forty wind chimes, representing the lives of our heroes, hang within the tower, while another Islamic-shaped crescent literally soars overhead. You may have seen how many Islamic minarets are adorned with Islamic crescents on top. Minarets are used to call the time to prayer. Architect Paul Murdoch’s minaret-like tower calls the time to prayer by shadow length (which is how Islamic prayer times are determined). They actually call it "The Tower of Voices." It is named this because the chimes are forever to be the voices of the people who died that day, calling out to love ones over the cell phones before the plane went down. 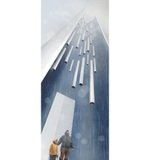 This is morbid in itself, but as per Paul Murdoch's design, the “voices” also harkens the call to Islamic prayers. For more information, please go to: www.CrescentOfBetrayal.com. To sign a petition, please go to: http://www.ipetitions.com/petition/HonorFlight93/. Special thanks to Alec Rawls, the author of Crescent of Betrayal, for his much appreciated edits in this article.